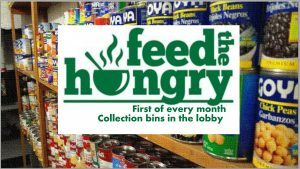 It is our practice that, on the first Sunday of each month, we bring non-perishable foodstuffs (canned, boxed, etc) to be delivered to the Fluvanna food Bank at Carysbrook. Place the food in the collection boxes in the Lobbies of both the Sanctuary and the Family Life Center (FLC). Read the Fluvanna Review’s article on rising food aid needs: Demand for food aid in Fluvanna skyrockets.